One of the best Hammer horror films of all time! Starring Peter Cushing and Christopher Lee. The Curse of Frankenstein is "the film that started it all," creature portrayer Lee said. 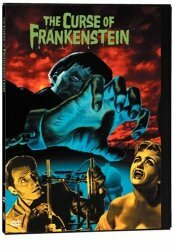 Indeed, this exciting classic from Hammer Studios almost singlehandedly revived screen gothic horror and initiated a series of scream hits pairing Lee and Cushing (playing Victor Frankenstein). The monster's appearance shocked audiences ... and before that, the cast and crew. "No one would eat with me (during lunch breaks) because I looked so awful!" Lee recalled.